3 Ways to Defeat "As Is" | Matthew E. Becker, Esq. In consumer transactions in Pennsylvania, the seller has the option of selling a product “As Is.” To the general public, this typically means you are agreeing to buy a product in its current state and the seller is not making any guarantees about the condition. For the most part, this is correct. However, “As Is” does not remove all liability off of the seller like most people think it does. When it comes to Automobiles, an “As Is” clause does not mean a dealership can sell you any vehicle and that you have no legal recourse. The most important thing to know that you may still have a claim even in an “As Is” sale. Even if you bought a car that was “As Is,” chance are the dealership did not follow that law. So, here are three ways to defeat any As Is purchase. The Window Sticker – Federal law says that every “As Is” sale must start with a sticker in the car’s window placing the buyer on notice of the “As Is” condition. This is called the FTC Buyer’s Guide. In 2016, the Federal Trade Commission updated the window sticker which means a dealership may be using the wrong window sticker. If the dealership does not follow Federal law, it cannot hide behind the “As Is” purchase. A Separate Warranty – A common tactic that dealerships will try is to sell you a car “As Is” and give you a warranty. Then, when you have a problem, the dealership will tell you to make a warranty claim. When the warranty won’t cover it, the dealership will say you are out of luck. That is not true. Pennsylvania Law prohibits the sale of a vehicle “As Is” if a warranty is also provided. Dealerships are not allowed to hide behind a warranty. 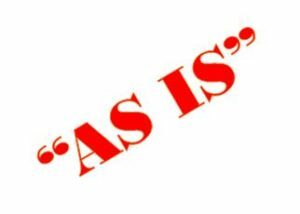 Rarely, a dealership does follow the law and does sell a car with a legit “As Is.” However, that still doesn’t mean you are without recourse. The Pennsylvania Uniform Commercial Code says an “As Is” clause only waives the Warranty of Merchantability and Warranty of Fitness for a Particular Purpose. For more information on As Is Sales, check out our page: http://mbeckerlaw.com/pennsylvania-lemon-law/buy-car-maybe-not/. Therefore, you still have claims under the Auto Fraud Laws, Negligence, and Breach of Contract. Don’t give up too easily. Most of time, you still have legal recourse for a bad car sale.